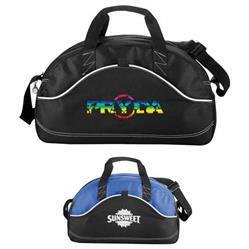 The Boomerang 18" Promotional Duffel Bag - a great custom sport duffel bag with an eye grabbing curved two-tone design. Main zippered compartment. Front main pocket and pen loop. Side mesh water bottle pocket. 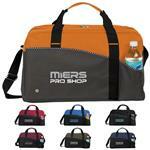 Permanent, adjustable shoulder strap. Two carry handles. Now available in Orange, Black, Red and Blue. FREE 1-DAY RUSH PRODUCTION AVAILABLE! Production Times Available: FREE 1-DAY RUSH PRODUCTION AVAILABLE! Standard 5-Day Production with Paper Proof. Dimensions: H 10" x W 8" x L 17.5"
Typical Imprint Area(s): Centered on Front Pocket L 6" x H 3"
Available Imprint Options: Full Color Imprint, Epoxy Domes and Embroidery available as well - please inquire! Materials: 600d Polycanvas and Diamond Non-Woven. Carton size H 15.74" x W 19.68" x L 12.2"